Also often very bright meteors with smoke trails and sound effects are called bolids. Are those are photoshops right? Nice piece of art! Not sure about that engine configuration though... everyone has hopped on board with the idea that the next version of F9 will have this octagonal engine config, even though there is little evidence to suggest it, and I'm pretty sure that it will have the same layout as present. And the stage is too short; it should be about 50% longer. Im betting this is the super heavy, the MCT. Possibly. I did some research, but I was unable to find any description given by the artist. It may be the MCT, it may be Falcon 9, or it may not be intended to be any particular vehicle at all. These rockets are enormous; those payload fairings are between 15 and 18 meters in diameter. I think that spaceX is dissatisfied with the tick tack toe configuration and is going octoganal in F9 v1.1. I remember reading somewhere that the fairing needed for the corner engines were a drag and they decided to change it. Cant find the article though. I found the fedEx one last night. tis glorious. Woot! SpaceX has been awarded two EELV-class launches by the U.S. Air Force, breaking the monopoly on government launches previously held by the United Launch Alliance, a joint venture between Boeing and Lockheed Martin. 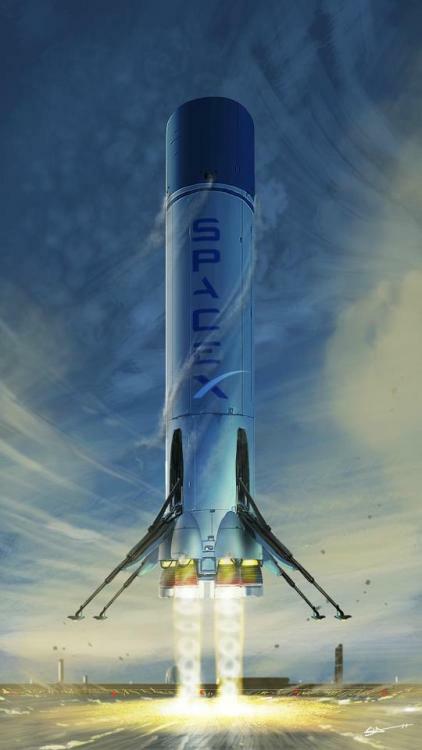 One mission will be launched on a Falcon 9 in late 2014, and the other will launch on a Falcon Heavy in mid 2015. These missions will support the process of getting SpaceX's Falcon rockets certified into the EELV program. Elon Musk has estimated that if all (non-NASA) government launches were switched to SpaceX vehicles, it would save the government $2 billion per year. Tomorrow danish rocket amateurs will launch a new homemade capsule using a homemade rocket capable of reaching 1.4 km altitude. The coming launch is a test the LES rocket and Tycho Deep Space capsule. The project is called Copenhagen Suborbitals. Founded in 2008 and privately funded. The 2 founders are working fulltime with a group of about 20 volunteer specialists trying to launch a man into space. Their aim is to launch human beings into space on privately build spacecrafts and show an alternative to expensive government controlled projects. Cool! Sounds similar to ARCA in Romania. The launch was a partial sucess. For some reason the rocket tumbled and didn't reach the targeted altitude,and as a result of the tumbling the parachutes did not open fully and the rocket impacted the sea at a much too high velocity. Still the timing and execution of the LES worked perfectly. So the constructors will be back working on the stability of the rocket which sadly may prove to be a rather difficult problem. I looked at the ARCA, and i'm impressed. This is a much larger scale project than what they have planned here. Then i learned about the google lunar xprize and i'm excited. So the teams have until the end of 2015 to land on the moon, travel 500 meters and return video footage of the feat. It's soon. This will be great if not for the industry or the science, then just as importantly to return focus on space exploration. It's en event that cannot be ignored and will inspire people everywhere. I'll be checking out SpaceX. I haven't had the time yet. i do remember noticing the name a couple of times in the news. But how i missed that Google Xprize i have no idea. I dream of founding my own space company and start sending probes to Moon, Mars, Jupiter. I hate waiting for NASA to launch next mission to explore Galilean satellites in 2020 (and it will take 7 more years to reach Jupiter!). Unlike ARCA and Suborbitals, SpaceX is a large company (just started 10 years ago though! ), and they have achieved amazing work in the development of orbital launch vehicles and spacecraft. Here is a link here that describes how much they have already accomplished (as of last year), including the extremely low price and time to develop and fly their hardware. They have a contract with NASA for 12 cargo flights to the ISS, and they just flew their final demo flight in May, and are being funded for developing a manned spacecraft to fly astronauts to orbit, and they have a very innovative design compared to other companies. Watch the first two videos here to see their plans for manned flight (in a few years), and their ISS mission a few months ago (fully successful!). SpaceX may have lots of contracts now, but when they started out they had to invest their own money (mostly it was just one man, Elon Musk).